Love Actually, ugly sweaters, twinkling lights. The holiday season is obviously a time for Awesome Things. But we all know the awesomest thing is giving, and one of the awesomest-est things is giving books! So, in the spirit of goodwill and spreading glittery joy, Mindi and I are having a giveaway! Mindi’s offering up a copy of one of her books and well, since I don’t have a book, I’m giving away a book I wish I’d written. Fun! 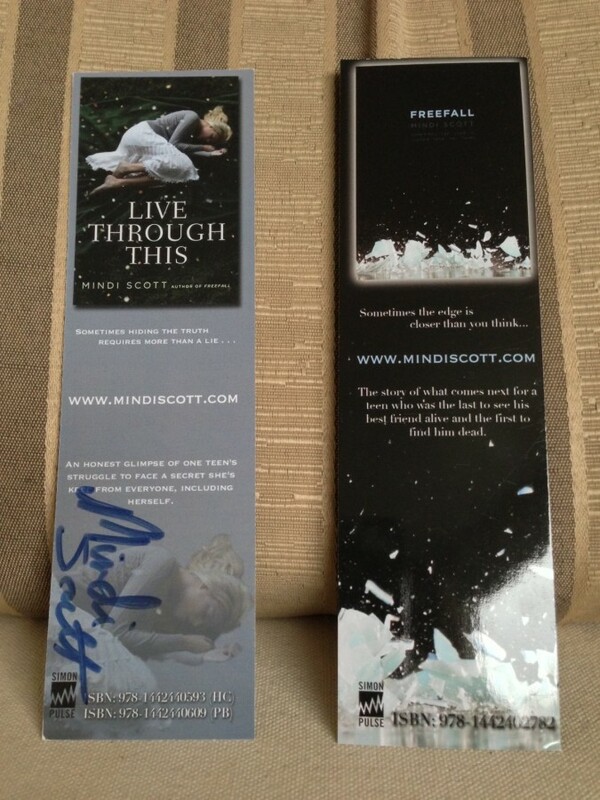 And Mindi’s throwing in some FREEFALL/LIVE THROUGH THIS bookmarks! I want to win!! Badly!! Thanks for entering, Erika! Good luck! Ever since I first learned about this book I’ve been trying to get my grubby hands on it. The cover is beyond gorgeous. I’m sure it’s bound to be a great read. Plus, Mindi is a sweetheart!! Mindi IS a sweetheart and fabulous writer — you’re going to love the book! Good luck!! YAY! Merry Christmas to you! Oh I love the UK cover of The Sky is Everywhere! So pretty! And thank you Mindi for tweeting me this giveaway! I want to read Live Through This very badly! Thanks for the chance to win these awesome prizes, and Merry Christmas! Isn’t it so pretty? The illustrations on the inside are pretty too 🙂 Hope you have a merry Christmas! Thanks for recommending this giveaway. Would like to read both of these. Thanks for the chance to win Merry Christmas and Happy New Year. Thanks for entering, Crystal! Happy Holidays! The Sky is Everywhere is one of my FAVOURITE reads, and even though I already own a copy I love love love the UK cover and want that one too haha. Thanks for doing the giveaway, happy holidays! It’s a lovely cover, isn’t it? 🙂 Happy holidays to you! It’s one of my favorites, too, Ashley! And I totally recommend hoarding as many editions of your favorite books as possible 😉 Best of luck and happy holidays! I really would love to win this. Ah! These are two great titles! I haven’t got a chance to read them yet and would love to! Thanks for entering! Good luck and happy holidays, Jill! YAY, go contemps!! Thanks for entering, Christina! Happy Holidays to you!